The key to finding your perfect pair? Choose frames that give contrast to your strong facial features. For people with square faces, this means that round and oval frames are your best bets. Don't fret, though. Sunglasses for square faces are some of the boldest and expressive. Take a look below at the best sunglasses for square faces. Step in front of a mirror and check yourself out. From the top, people with square faces have broad foreheads that are wider from side to side. Their cheeks are not angled and placed higher like on other faces, but remain in line with the other features on their face. Lastly, a clear sign is the shape of the chin. A square face's most telling characteristic is a strong horizontal jawline. Feel like this description fits you? 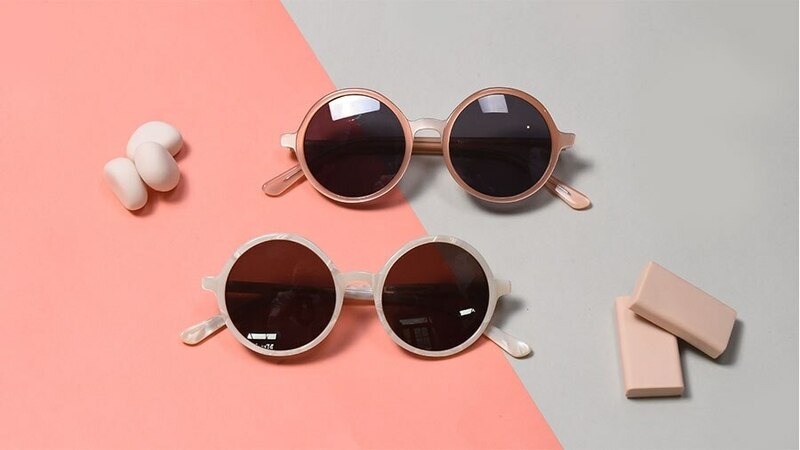 You're in luck — EyeBuyDirect has got hundreds of different sunglasses for square faces that'll bring your style to life, regardless of aesthetic. It's obvious, but round sunglasses frames are a great addition to any summer outfit. Try wearing them in metal, and they're even better. Flirty and fun. A pair of colored oval frames can do the trick. We all know that the key to searching for the best glasses for square faces is to soften the strong angles you have. Adding in a wild pop of color will give you that vital effect and make a bold statement at the same time. Browline frames are a fashion-forward classic, and are perfect for a hike in the mountains or a jaunt on the beach. The brow-heavy design makes this style one of the best sunglasses for square faces. If you have a square face, it's easy to be confident and loud with your sunglasses. However, there are still some things to keep in mind before you make your selection. As an accessory, eyewear is meant to balance and contrast your facial features. This means that it's best to avoid sunglasses that are rectangular or square. Why? Adding even more angles to your strong and proportioned face might make your face look too wide and rigid. Another tip is to stick to darkly colored frames. A round frame that is too lightly colored won't give as much contrast to the lines in your face as it could in a darker color. Keep this in mind, and you're already on the way to finding your perfect pair. For some, shopping for sunglasses online is a new experience. That's why we've come up with a useful feature to make your search for the perfect pair easier. With the EyeTry tool, you can virtually try on any pair of sunglasses you find here. Start by clicking on any pair of frames that catches your eye. Then, hit the "Try On" button to get started. All you need to do next is upload a photo of yourself to see how you might look in the glasses you chose. It's that simple. Take a peek below at our selection of trendy sunglasses for square faces and get started.